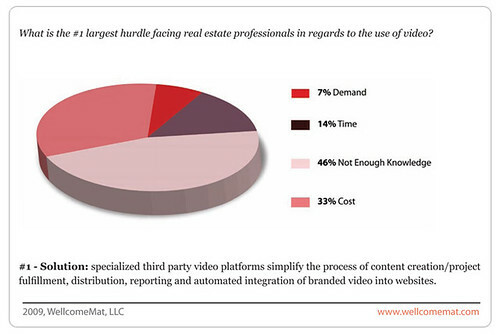 Online real estate video host Wellcomehost released its first annual report on the use of video in real estate marketing. Significantly, the company found that the use of video is up 95% in the first half of 2009 versus the first half of 2008. Breakouts like Realtor Ian Watt (see Video Isn’t Just About Your Listings) set the bar for the creative use of video and also seemed to have kick-started a whole generation of car-mounted video blog posts. But it’s not only the little guys getting in on the fun; big brands like Corcoran Group are embracing video too. 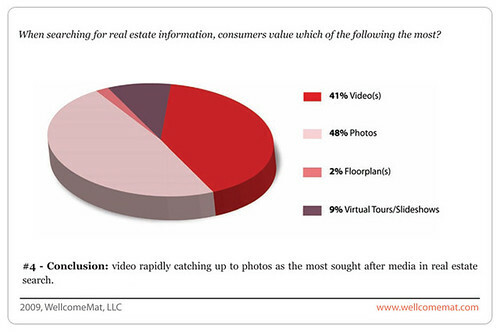 What I found particularly interesting in the report however, was the breakdown of the how real estate professionals are using video. Marketing listings comes in at the top of the list 30 per cent; showcasing local areas and professional introductions round out the top three but oddly, demonstrating market knowledge comes in dead last. Here’s a few more slides from the full report.